A facility manager is the person responsible for coordinating all the employees and entities involved in the facility to ensure that they work on behalf of the facility and help meet its short- and long-term goals and objectives. Future facilities raise numerous concerns such as where to build, what to build, and how to pay for the facility. Only through effective planning can a facility be developed that meets the greatest current needs, anticipates future needs, and causes the least amount of harm. In spring 2007, bulldozers started removing the grass turf at the Hall High School field in West Hartford, Connecticut. After examining the cost - benefit analysis for installing an artificial turf field, West Hartford decided to replace both high school grass fields with artificial turf systems. Managing Sport Facilities, Third Edition, continues the tradition set by its predecessors of providing future and current sport facility managers with the knowledge they need in order to make the proper decisions in all areas of facility management. Like the previous two versions, the third edition provides a comprehensive understanding of crafting a career in running a sport facility. In response to its increasing importance over the last decade, the newest chapter in this text focuses on implementing and maintaining green facilities. This chapter details items that should be considered during the construction of new environmentally conscious facilities as well as information on retrofitting and updating older facilities with green technology, such as recycling initiatives and solar panels. A facility built according to Leadership in Energy and Environmental Design (LEED) standards may lose its certification if not properly maintained over time, so tips for preserving green facilities are also included. In Managing Sport Facilities, Third Edition, students will learn the history of the sport facility industry and the primary goals and objectives of facility managers; how to build and finance a facility; facility operation; administration of marketing, finance, and other critical areas; and event administration and management. A comprehensive approach to understanding the wide-ranging job of sport facility managers has been applied, with a structure that builds from general to specific, and finally to practical knowledge in the final chapter. In addition, the text offers updated content in the Sport Facility Management Profiles, Facilities Trivia, Behind the Scenes, and Facility Focus sidebars in each chapter, which bring the theories and concepts to life by citing specific examples of strategies used in making a facility—and the facility manager—more successful. New instructor videos that can be shared during class provide students with a glimpse into the lives of real-world professionals as they provide insight and advice. Managing Sport Facilities, Third Edition, contains extensive textbook learning aids, including real-world checklists and forms that allow students a glimpse of some of the tools and guidelines that professionals use in their work. Each chapter begins with objectives and an overview and concludes with a summary and discussion questions and activities. The instructor ancillaries will help instructors prepare for and teach classes, and the text itself has an engaging style that makes the reading cogent and easy to remember. Starting from its already-solid foundation, the new material, updates, ancillaries, and practical learning aids make this third edition the most complete and up-to-date text on the subject. Students using this text will learn what it takes to blend leadership, operations management, and creativity in promotions as they begin their journey to being top-notch sport facility managers. 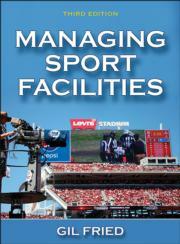 Text for students in sport facility management or sport facility and event management courses. A reference for sport facility managers and industry professionals. Gil B. Fried, JD, is a professor at the University of New Haven in Connecticut. He has taught sport facility management for more than 20 years and has written numerous articles, books, and book chapters on sport facility management issues. Fried speaks throughout the United States on issues such as building and financing facilities and dealing with risk management concerns. He was the director of risk management for OR&L Facility Management, which manages several million square feet of space. He has also worked with the International Association of Venue Managers (IAVM) and developed the curriculum and materials for the IAVM’s Academy for Venue Safety & Security. Besides taking pictures of numerous sport facilities to include in future versions of this text, Fried enjoys playing badminton, farming, being with his wife and kids, and traveling. All ancillary materials are free to course adopters and available at www.HumanKinetics.com/ManagingSportFacilities. Instructor guide. Includes objectives, summaries, and key terms for each chapter; suggestions for guest lecturers and tips for covering potentially difficult material; suggested answers to the book’s discussion questions; supplemental class activities; two semester-long case studies; and suggested background readings and web resources. It also includes a reference document to help instructors who may want to incorporate the book into a combined course on facilities and events. Test package. Includes more than 500 questions in true-or-false, multiple-choice, and essay formats, and is available for use through multiple formats, including a learning management system, Respondus, and rich text. Presentation package. Includes 355 slides covering the key points from the text, separated by chapter. Instructor videos. Contains more than 20 video clips featuring interviews with industry professionals who give insight and advice on their multifaceted careers. These interviews may supplement class lectures and will help students understand the range of duties involved in this challenging and exciting occupation. Video content features industry professionals giving insight and advice on their multifaceted careers.